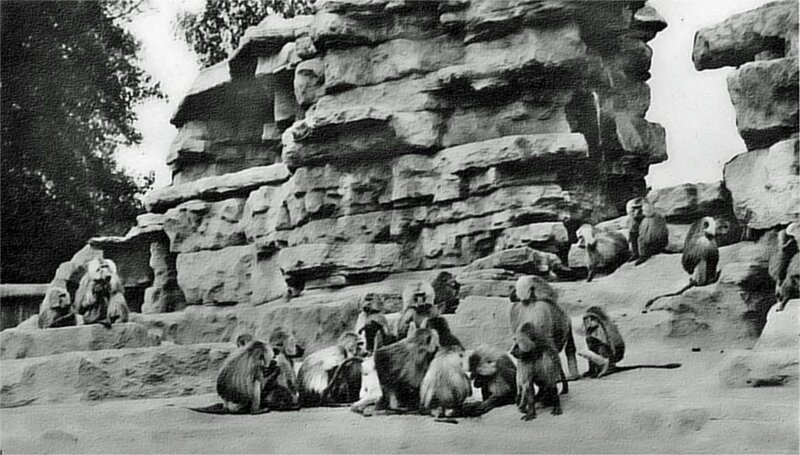 It may not be generally known that James Pulham and Son did some work at the London Zoo, but this is a place in which I have some personal interest, because my grandfather, Frederick Hitching, was responsible for some of it. When my brother and I were children, he often used to tell us stories about the various places at which he had worked, and one of these was London Zoo, where he said he worked on the Sea Lion Pond and the Monkey Enclosure. 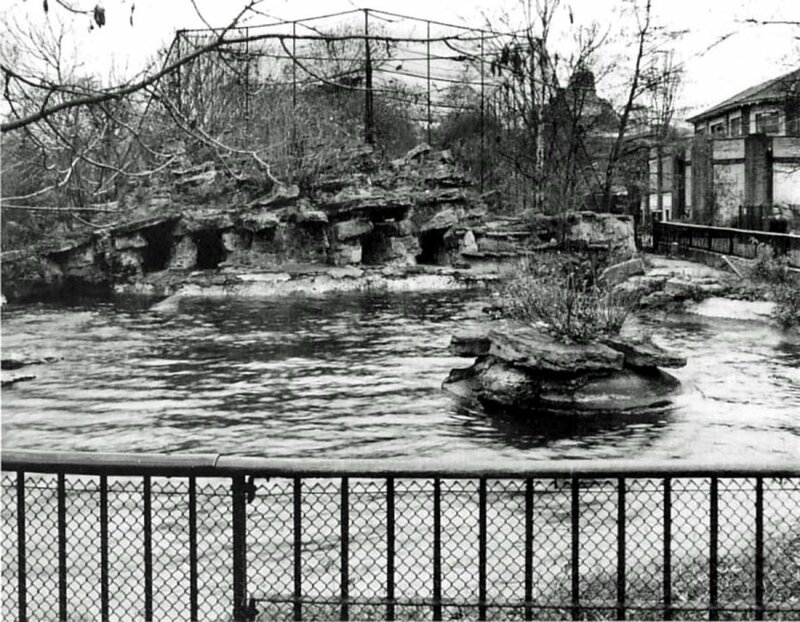 According to Peter Guillery’s book, Buildings of London Zoo,[i] the Sea Lion Pond was built in 1905, and was London Zoo’s first attempt at a naturalistic outdoor display, based on similar structures to those in the zoos of Paris and Cologne. As can be seen from Fig 1, there used to be some small rock islands in the pool, but these were removed when the pool was remade in 1991. The ‘Monkey Enclosure’ mentioned by my grandfather was presumably the Prairie Marmot Enclosure that was built as a Coypu Pond in 1912-13. At the time of its construction, it was a novel display, because it was free of bars or fencing. The rockwork at the centre conceals sleeping boxes, and one can see what this looked like from an old postcard, reproduced here in Fig 2. 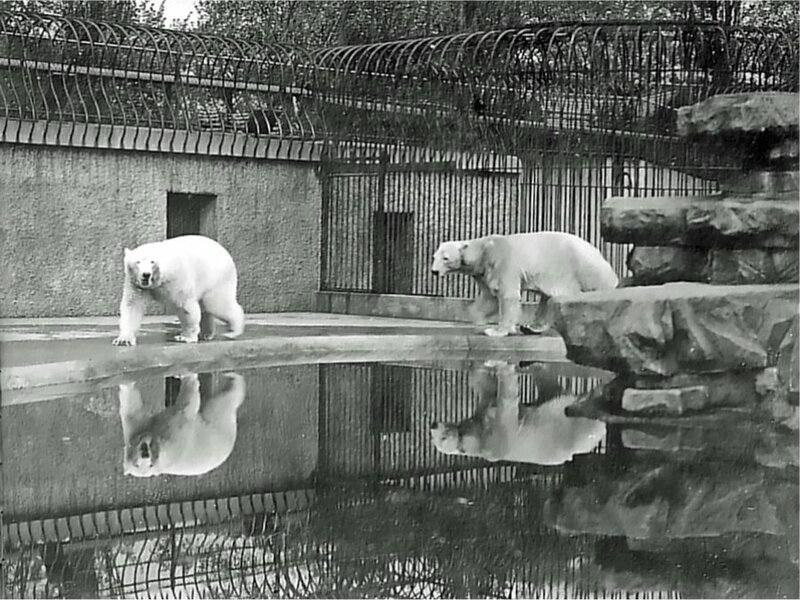 Another book – by John Edwards, entitled London Zoo from Old Photographs, [ii] – contains a photograph of the Polar Bear Enclosure, which was completed in 1910 at a cost of £1,000. The photograph in Fig 3 shows Sam and Barbara taking a turn around the edge of the pool, and was taken by Mr D Seth-Smith in 1911. Unfortunately, this structure was not a success, because the bears spent far less time in the water than had been expected, so it was very quickly removed, and replaced by the Mappin Terraces. According to Sally Festing – writing in an article in the Journal of The Garden History Society [iii] – a Zoological Society account book for this period lists a payment of £38 to Pulham and Son in May 1910 for rockwork constructed in the Polar Bear Enclosure, and a further sum of £22 in December 1913 for rockwork in connection with the Coypu and Beaver ponds. No wonder my grandfather never seemed to have much money to spare . . .
Posted on July 1, 2013 June 4, 2016 by Claude HitchingPosted in Sites Month 2Tagged . . James Pulham and Son, frederick hitching, London Zoo, Monkey Enclosure, Polar Bear Enclosure, Regent's Park London, Sea Lion Enclosure.